In 1918, Sears introduced two Prairie Style houses in the Honor Bilt Modern Homes catalog. 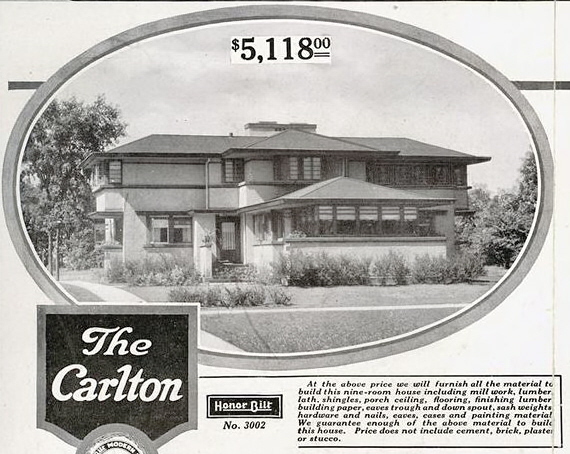 The Carlton, offered at $5118, was “a prominent architect’s conception of what a twentieth century residence should be.” It was most expensive home Sears ever offered. “This is a house with individuality and that will be a constant source of pleasure and pride to its owner,” according to the catalog. It had projecting wings and a low-pitched hipped roof. The Aurora was a scaled down version of the Carlton. This model “is much favored by discriminating builders and is found in the most exclusive communities,” according to the catalog. The price was $2,740. In 1907, Van Bergen was a draftsman for Walter Burley Griffin and in 1909 he started working under Wright at his studio in Oak Park. Van Bergen subsequently started his own practice and designed many Prairie Style homes in the Chicago area from 1911-1954. When the United States entered World War I in 1917, Van Bergen’s career came to a halt. “The future looked very black,” he wrote. With no work prospects, he enlisted in the army in 1918. Since Van Bergen had cash troubles, Sears, Roebuck was able to license the plans for the Carlton and the Aurora from him around this time. But how do we know Van Bergen designed the Carlton and the Aurora? Sears never formally identified Van Bergen as the architect. 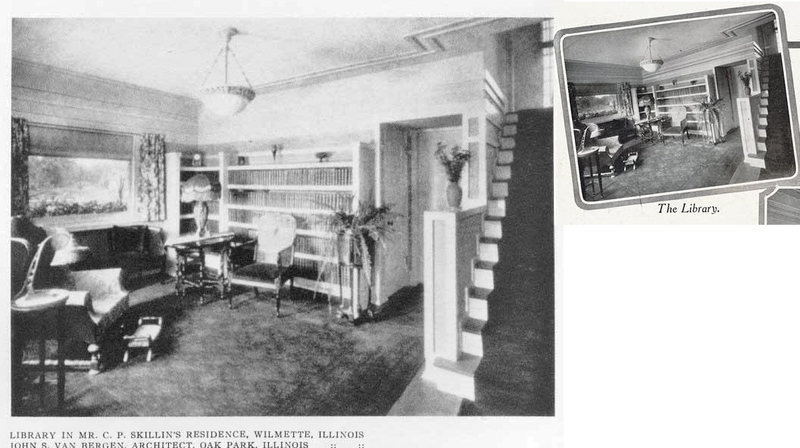 However, the Carlton had an identical floor plan to the Skillin house in Wilmette, designed by Van Bergen. 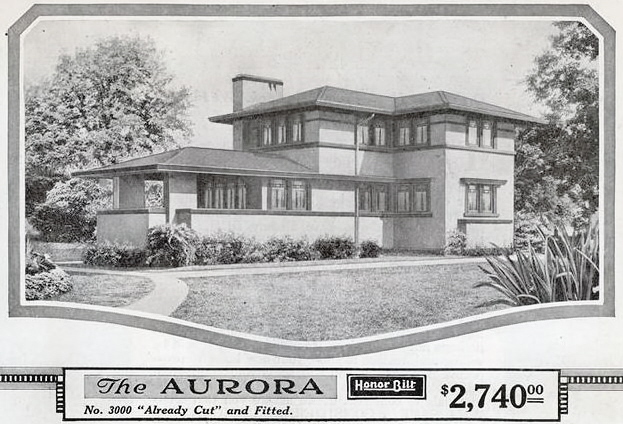 The Aurora had an identical floor plan to the Griffith house in Oak Park, also designed by Van Bergen. Additionally, the 1918 catalog featured the same photos of the interior of the Skillin house that were shown in the April 1915 edition of Western Architect. The library in the Skillin house (left) and the photo from the Sears catalog. 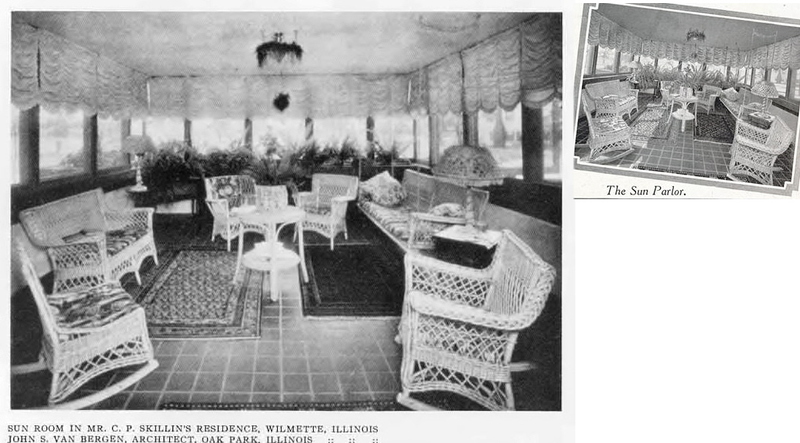 The sun room in the Skillin house (left) and the photo from the Sears catalog. The William H. Griffith house in Oak Park was built in 1913. The balcony off the front bedroom is now enclosed. Sears clearly had big expectations for these homes. They featured them prominently on the first few pages of the 1918 catalog. But the Carlton and the Aurora evidently did not sell because Sears never offered them again. It could have been the high prices, or the fact that the styles did not appeal to mass-market tastes. Another problem was the Carlton required a 75-foot wide lot. For reference, the standard lot size in the city of Chicago is 25 feet. My lot is 68 feet wide and that's considered large for Arlington Heights. To my knowledge, a Sears Carlton has never been found, and perhaps it was never built. There is a Sears Aurora in Cincinnati, Ohio that was sold in 2010 for $265,000. Researcher Cindy Catanzaro found incontrovertible evidence that the Sears Aurora in Cincinnati was built in 1926--eight years after the Aurora model was for sale! The original owner was J.J. McHugh, a manager at the Sears Roebuck millwork plant in Norwood. The cost to build was $25,000 in 1926. Kit houses (even expensive ones) did not cost $25,000 to build in 1926. It is very likely that the Aurora in Cincinnati was custom built using the original Sears blueprints (and Sears materials from Norwood), but was not a Sears pre-cut kit house, per se. Although this house is a Sears Aurora as designed by John Van Bergen, it would also be true to say we have yet to find a true Sears Aurora kit house (and, like the Sears Carlton, one may not have been sold). The McHugh family lived in the Aurora until 1935, when Sears relocated J.J. back to Chicago and they moved to a house in River Forest. Your blog is great! I got interested in mail order homes while living in Des Plaines (1991-2003). You've done a wonderful job of researching and presenting this material. I can't help but wonder if the naming of the house The Carlton was a sick joke on someone's part. The man who murdered Frank Lloyd Wright's lover, her two children, and several others at Taliesen was named Julian Carlton. Very great detective work! I'm impressed. NIce Job! Thanks, Larry, but I can't take credit for that discovery. I believe it was Marty Hackl who originally noticed the connection. So glad I ran into this article. We actually own the Griffith House in Oak Oark (the Aurora pictures above). Had no idea there was one built on the same plan on Cincinnati. There are 3 others based on that design nearby. We’ve been renting the house out since moving to DC several years ago. It will most likely be available to rent in June 2019.